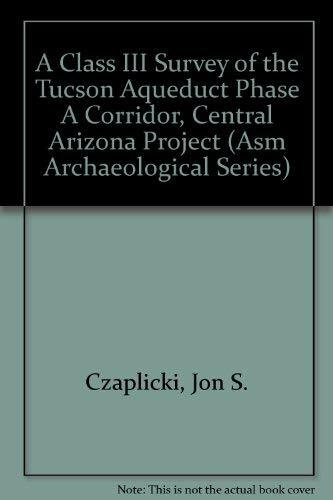 A Class III Survey of the Tucson Aqueduct Phase A Corridor, Central Arizona Project. An Intensive Archaeological Survey in the Lower Santa Cruz River Basin, Picacho Reservoir to Rillito, Arizona. Opened in as small store in 1980, we are now only in warehouse/storage space, but are still focused around the subjects of Anthropology and Natural History, used books and monographs. Our stock consists of about 40,000 titles, most of which are on-line. We are interested in buying collections in our fields of specialty. Our website may not be working, but try - Please visit our web site at http:\\nfaginbooks.com, otherwise email us for any and all questions. within the US. is $7.00. Global Priority where available is $28.00 We gurantee delivery within the US.